Bryan Dennis is a superstar (storytelling) accountant who has quickly risen to senior leadership in accounting and finance roles across the globe. Starting out at KPMG, one of the Big 4 accounting firms, Bryan focused on assisting with large capital markets transactions in Europe and the US. He then moved into private industry and has worked in senior roles in the software and packaging industries. I think after just about every sentence of this conversation, I was frantically taking notes because the tips Bryan kept giving were genius (he’s even convinced me that day-to-day number crunching can get really interesting). Bryan’s number one piece of advice for how to level up your leadership: develop genuine relationships because relationships are THE accelerator for your career. Why? Because building trust and rapport with people (even those you don’t think you strategically “need”) can drive your career forward in a way you couldn’t without a network. Open lines of communication between colleagues lead to more effectiveness better results. A good word from a friend in your network can get you your next big job. Mentors can help you solve your problems in minutes instead of days, weeks, or months of trying to solve it alone. Your network helps you to perform better and achieve more. Bryan suggests that great networking friendships are made in the “white space” that occurs when you’re not actually working. Grab a beer after work with a colleague, meet for a coffee during the day, even grab a breakfast sandwich together on the way into the office. Put in the time to build genuine connections and you’ll see the dividends come back exponentially. And Bryan’s not just talking the talk – his former colleagues and bosses were groomsmen in his wedding and the godparents of his children! You’ll see what I mean when I say Bryan is the nicest “war-time” leader I’ve ever met (if you don’t know what that is, have a listen!). How Bryan accidentally “stumbled backwards” into the field of accounting and finance. Why it’s okay that a finance expert still uses the calculator on his iPhone regularly. Why storytelling with numbers is the #1 differentiator between highly-successful finance people and those who have flatlined in their careers. How to actually go about crafting the message / story of your numbers (hint: the work starts before the numbers ever even show up). Why building relationships is Bryan’s number one piece of advice for how to level up your leadership (hint: because you build trust and rapport that drives your career). How open, honest communication is what really allows you to get your job done well. Why Bryan was a “border-line failure” the first 6 months of a new job and how he turned it around. Why your leadership styles need to adapt to the team you’re working with and flex to the current situations you’re facing. What changes you need to make to your leadership style as you move up the levels of leadership. Why it’s required every single day to determine what success will look like that day. The difference between a “war-time leader” and a “peace-time leader” and why, at the highest level, you can’t be both. The skills needed to be a successful “war-time leader”. How being empathetic is a huge part of the job AND how that sometimes conflicts with being results-focused. How you have to give up the idea of being an “individual contributor” and why leveraging others is the key to success (If I’m the last car in the parking lot, what am I doing wrong?). Why it’s critical to address personnel issues head on, even if there is short-term pain and it feels uncomfortable to address it with the employee. How Bryan successfully managed a short-term coup on his team. How Bryan allows his employees freedom and space and trust to grow their leadership skills. Why we have to do hard things every single day in order to be on the fast track to success. Why every time Bryan showed up to a new job, he felt like an impostor. How Bryan built self-belief in his ability to learn and take on new challenges and how he leveraged his network to make that belief a reality. Why your relationships with your co-workers should be anything but transactional. Tips for building a strategic network in the step where you’re at in your career and not focusing beyond the next 2-3 steps ahead of your current position. Why professional “dating” (aka building your network) is awkward for everyone and how you just learn to accept it as normal. What’s the right time to understand what you want to be “when you grow up”. 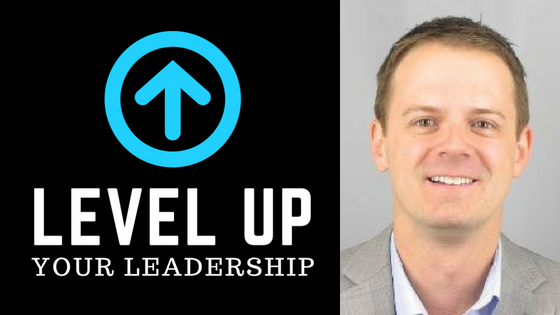 If you enjoyed the podcast, please rate and review it on iTunes or Google Play.– your ratings make a big difference in helping others discover Level Up Your Leadership. Want future episodes automatically delivered to your device? Be sure to subscribe. Thanks for listening!